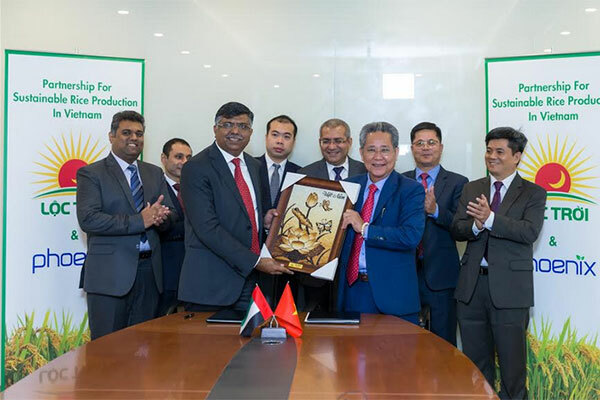 Phoenix Global DMCC has signed a cooperation agreement with Vietnam-based Loc Troi Group to enhance sustainable rice production and to strengthen good economic relations between the two companies. In a joint statement, the companies said the agreement will benefit 10,000 Viet small holder farmers enhance sustainable rice farming over 10,000 hectares of paddy field. Witnessing the ceremony were present officials and diplomats- Franco Bosoni, Director Innovation Hub, DMCC, Antony Furtado of Food Trade Group, DMCC and Le Phuong, commercial counsellor and head of Vietnam Trade Office in Dubai. They said that consumers of UAE and Middle Eastern region would also be the beneficiary by way of imports of low chemical residue and sustainable rice which will be produced in Vietnam as a result of this partnership. The agreement also aims to help the small holder farmers in Vietnam achieve resilience to cushion the adverse effects of climate change, pest infestation, drought, floods and other calamities that are being experienced quite frequently over the past few years, the statement said.